If you already have a chess board or have one in mind, the best way to find the best chessmen is by the size of the pieces. Nothing can be more frustrating than finding a luxury chess set you love and then determining it will not fit on the board you have! Don't worry. Instead of searching by wood type or design, you can browse all our Staunton chess pieces by king height in the categories below. 2 1/2" Chessmen are small pieces that are best suited for an analysis style chess board or a small display on a table, desk, or shelves. Most often these sets are used for solo play. These pieces are intended for a chess board with a 1 1/2" square size, but some can fit on a smaller board. 3" to 3 1/2" Chessmen are a popular 'executive' size. They are large enough to play comfortably, but small enough to fit on an end table or coffee table as an accent without overwhelming a space. These pieces are intended for a chess board with a 1 3/4" square size, but some can also fit on a smaller board. 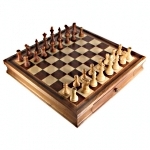 3 3/4" to 4 1/4" Chessmen include all of the tournament sized chess pieces we carry. This is the most popular size due to the large pieces that feel very well in your hand - but they do require larger chess boards that make them often a focal point of a room as opposed to an accent. While tournament size boards have 2 1/4" squares, many of these pieces can also fit a 2" board quite comfortably and some feel that match up is more aesthetically pleasing. If you're overwhelmed at all of the options we don't blame you. It can be very difficult selecting the right chess pieces and board. This section contains traditional chess sets that include the pieces and board in a number of different sizes and styles. Looking for storage? While ideally your chess set should be on display, that is not always an option. You can see our selection of boxes to store your chess pieces in here. We carry an amazing selection of chess pieces that should fit any need. You will notice on this page that our pieces are categorized by size. While this is often very helpful, you can also browse by wood type of design style from the main staunton chess pieces page.